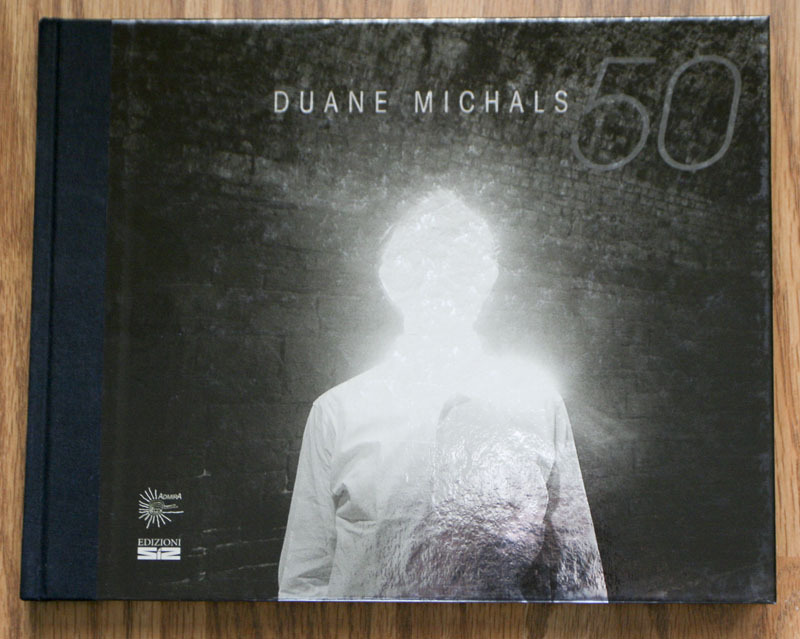 Spending time with the recent Duane Michals book, 50, a fifty year retrospective by the Italian publisher Siz, was essentially re-experiencing much of my own photographic life, having come of photographic age with his somnambulist period. His fascination with dreams, dreamlike states and dream-walking precedes our current interest with making connections to memories. Michals is whimsical, elusive, sensitive, cerebral, witty, caustic, introspective, challenging and seemly always on the move, pushing boundaries along a zigzag course of his own making. The book ostensibly sets out to describe the broad spectrum of Michals career, which it does very well, but excludes his combination photographic/painting that were not received to wide acclaim in the 1980’s. This retrospective begins with his earliest portraits, which paved the way into his commercial career. Michals’s multiple exposure portraits of the famous painter Rene Magritte, pair of photographs below, foretold of his well-known “Sequences” of the late 60s and 70s. In the use of the double exposures, Michals weaves in other trademark elements of Magritte’s paintings in this iconic portrait. In his Sequences he fully delves into the world of the Somnambulist, the dream walker, utilizing sequential images, multiple exposures and eventually hand-written narrations that developed into raw poetic verse, declarations, statements and always questions. Most, if not all, of Michals’s Sequences are contained with this retrospective, which provides an opportunity to study this important, and arguably his most critical, body of work. Subsequent to the Sequences, his sarcastic wit was fully revealed with his “About Contemporary Art” series; probably best know for ribbing Cindy Sherman with the title “Who is Sidney Sherman?” and mocking post-modern art in general. This series is somewhat ironic in that Michals double exposures, sequences and hand written narratives challenged the modernistic norm of the 1960s and 70s. One weakness of the book is that the supporting essays, including his interview with Enrica Vigano, are in Italian. Overall, lacking an English translation in the book does not diminish an appreciation of Michals first fifty years and provides me with wonder on what still may be yet to come. Additionally, his hand written narratives in English included within many of his photographic projects provides a layer of supporting contextual information.